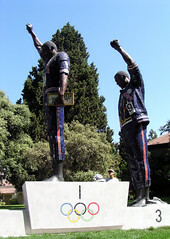 On October 16, 1968, SJSU students Tommie Smith and John Carlos made a silent gesture on top of the Olympic podium that shook the world and put San Jose on the map. Forty years later, the university will relive that spirit of activism by hosting Legacy Week from Oct. 13-16, according to the Spartan Daily (Read their excellent special section here). Events include a keynote from activist rapper Chuck D of Public Enemy, public screenings of a documentary, a “Speed City” exhibition at the Cesar Chavez Community Action Center, and information on what SJSU has done — and continues to do — to encourage activism. On what part of the campus the statue located?